Our 2018 Model Year Clearance Event has begun. Offers only availible on in-stock inventory. *Limited time lease and finance offers available through Audi Finance on approved credit, on select new and unregistered A4 allroad models. European models shown with optional equipment that may not be available at the time of purchase. Offers end February 28, 2019 and are subject to change or cancellation without notice. Offer applies to in stock A4 allroads only. *$4,000 lease/finance bonus is structured as $2,000 from Audi Canada and an additional $2,000 from Audi Kitchener-Waterloo. *$5000 cash purchase credit is structured as 3,000 from Audi Canada and an additional $2,000 from Audi Kitchener-Waterloo. † Audi Credit to be applied as a discount to the MSRP before taxes on purchase or lease of 2018 A4 allroad models. *Limited time lease and finance offers available through Audi Finance on approved credit, on select new and unregistered Q7 models. European models shown with optional equipment that may not be available at the time of purchase. Offers end February 28, 2019 and are subject to change or cancellation without notice. Offer applies to in-stock Q5 only. *$6500 finance credit is structuresed as $4,500 from Audi Canada, $2,000 from Audi kitchener-Waterloo. *$7500 Cash credit is structuresed as $5,500 from Audi Canada, $2,000 from Audi kitchener-Waterloo. *$5000 finance credit is structuresed as $3,000 from Audi Canada, $2,000 from Audi kitchener-Waterloo. *Limited time lease and finance offers available through Audi Finance on approved credit, on select new and unregistered Q5 models. European models shown with optional equipment that may not be available at the time of purchase. Offers end February 28, 2019 and are subject to change or cancellation without notice. Offer applies to in-stock Q5 only. *$4500 sales credit is structuresed as $1,000 from Audi Canada, $1,500 from Audi kitchener-Waterloo. 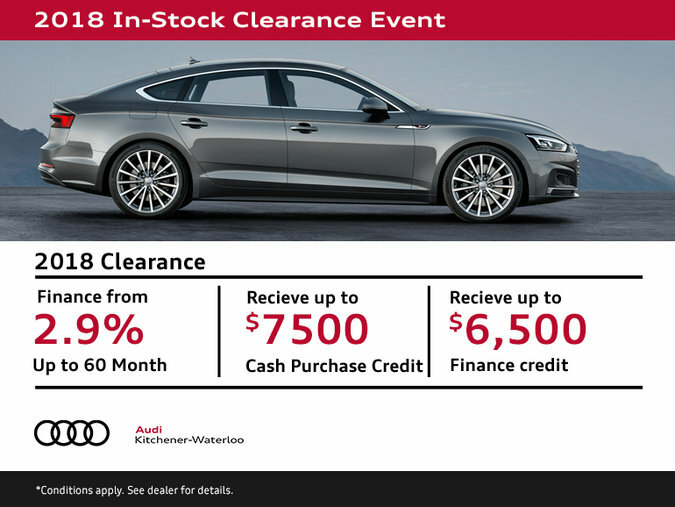 *Limited time lease and finance offers available through Audi Finance on approved credit, on select new and unregistered A5/S5 and RS5 Sportback models. European models shown with optional equipment that may not be available at the time of purchase. Offers end February 28, 2019 and are subject to change or cancellation without notice. Offer applies to in-stock A5 sportbacks only. *$4500 sales credit is structuresed as $3,000 from Audi Canada, $1,500 from Audi kitchener-Waterloo.